WASHINGTON - Bowing to President Bush, the Democratic-controlled Congress grudgingly approved fresh billions for the Iraq war Thursday night, minus the troop withdrawal timeline that drew his earlier veto. "The Iraqi government needs to show real progress in return for America's continued support and sacrifice," said the commander in chief, and he warned that August could prove to be a bloody month for US troops in Baghdad's murderous neighborhoods. Five months in power on Capitol Hill, Democrats in both houses coupled their concession to the president with pledges to challenge his policies anew. "This debate will go on," vowed House Speaker Nancy Pelosi , and if anything, Senate Majority Leader Harry Reid of Nevada was more emphatic. From the White House to the Capitol, the day's events closed out one chapter in an epic struggle pitting Congress against commander in chief over a war that has claimed the lives of more than 3,400 US troops. The bill establishes a series of goals for the Iraqi government to meet as it strives to build a democratic country able to defend its own borders. Continued US reconstruction aid would be conditioned on progress toward the so-called benchmarks, although Bush retains the authority to order that the funds be spent regardless of how the Baghdad government performs. "I hate this agreement," said Rep. David Obey , D-Wis., chairman of the House Appropriations Committee, who played a key role in talks with the White House that yielded the measure. 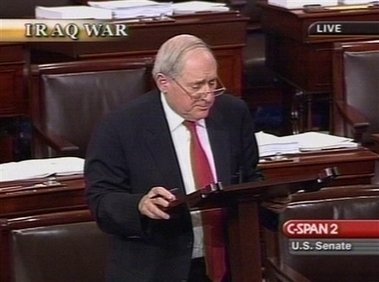 He voted against the money, but Sen. Carl Levin , D-Mich., no less an opponent of the conflict, cast a different vote. That left Sens. Hillary Rodham Clinton of New York and Barack Obama of Illinois publicly uncommitted in the hours leading to the vote, two leading White House rivals tugged in one direction by the needs of 165,000 US troops - and in another by party activists demanding rejection of the legislation. As time ran out on the roll call, first he, then she, voted no.